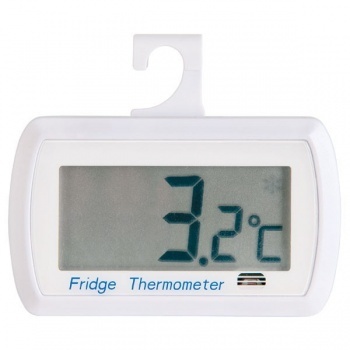 This digital fridge thermometer designed to hang inside the fridge incorporates a large and clear digital display that indicates temperature over the range of -9.9 to 49.9 °C with a 0.1 °C resolution. The fridge thermometer's energy saving feature turns the unit off when the unit is deprived of light, maximising battery life. The fridge thermometer is powered by a single CR2032 battery with a life expectancy of 5 years. The fridge thermometer is housed in a robust ABS case that measures 18 x 42 x 71 mm and can be free-standing or hung from a shelf in the fridge. Clear large display. Excellent instructions and details of what temperature the fridge should be. I hadn't a clue and thought my fridge was not cold enough and this thermometer proved me right - I had to turn it up from 3 to 6!! to get the correct temperature. Place near back on the middle shelf. The thermometer has a hook to hang on the shelves but if you have glass shelves then the hook folds down to create a fairly sturdy stand and the thermometer can then be stood on the shelf and easily read. It has a battery save mode so the display switches off in the dark and springs to life when you open the fridge and the lights comes on. Very reasonably priced for an essential item. Simple to use. Fast delivery. Happy so far. great for glancing at each time the fridge door is opened. the added bonus is tate should the fridge have failed 'between glances' the in-built alarm will notify you.